Tseng Kwong Chi... Pisa, Italy, 1989 (silver gelatin print, edition of 9). From the exhibition Tseng Kwong Chi: Self Portraits, 1979-1989 at Paul Kasim Gallery in New York. "...The son of exiled Chinese nationalists, Tseng Kwong Chi was part of an intimate circle of artists, Keith Haring, Kenny Scharf, and Cindy Sherman among them, who took the center stage of the New York art world during the nineteen-eighties. As a Hong-Kong born, Paris-trained artist, Tseng viewed himself as a citizen of the world and eschewed labeling himself or his art as 'Chinese.' However, his ironic self-portraits posed in a Mao suit in front of American landmarks found their way to Communist China and were profoundly influential for China's avant-garde, including conceptual artists Song Dong and Zhang Huan, who were exposed to Tseng's images through western magazines smuggled into the country in the 1980's. 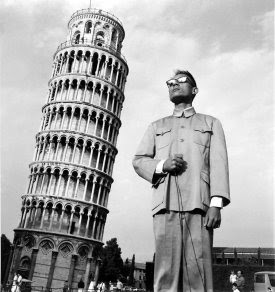 Tseng's photographs not only satirized relations between the United States and its emerging rival, China, but also broadcasted his freedom of movement - a privilege denied most Chinese artists at the time."